According to feng shui expert Lillian Too, there is a possibility of a major volcanic eruption this year. “This is because the element of fire is sitting on top of the element of earth in the Year of the Fire Dog. This indicates a big explosion that could come in the form of a volcanic disaster. Too at talk for Genting Worldcard members. During the event, she also talked about how feng shui can be applied to enhance careers, improve income, find romance and ward off misfortune. “There is also the possibility of major natural disasters such as earthquakes,” Too told an audience of more than 1,500 people at the Arena of Stars in Genting Highlands recently. The three-hour talk, entitled Your Fortune And Feng Shui In 2006, was organised solely for Genting WorldCard members. During the event, the 60-year-old Too talked about how feng shui could be applied to enhance careers, improve income, find romance as well as ward off misfortune, accidents and illnesses. Too said the advice she gave was based on her analysis of 2006 feng shui charts. She added that the Year of the Fire Dog should be good for industries related to the elements of earth and fire, such as restaurant, lighting, construction, real estate and property development. 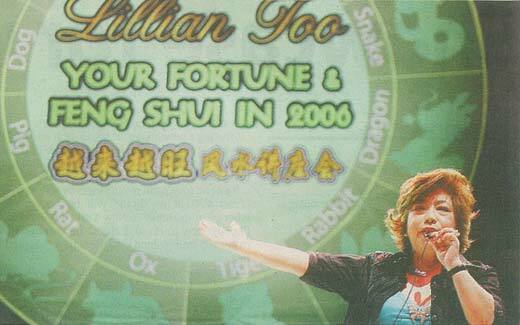 During the event, Too also provided horoscope predictions based on the Chinese animal zodiac. The event ended with a 20-minute question-and-answer session with the audience and a lucky draw where five winners walked away with hampers sponsored by World Of Feng Shui.